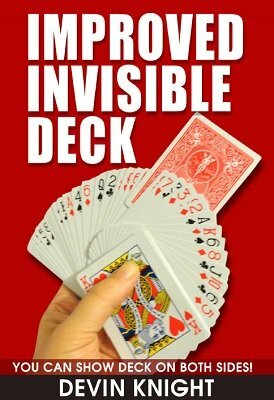 This is the invisible deck on steroids and many magicians are saying this will make the old invisible deck obsolete and everyone will want this new and improved version. It allows you do things not possible with the standard invisible deck such as showing the deck on BOTH SIDES - showing both faces and backs. Now that we have your attention, read on. There is only ONE DECK used and it is in full view from the start. THE EFFECT: The invisible deck is one of magic's biggest sellers. Almost every magician owns one. Unfortunately, a lot of lay people own them too, since they are sold in public magic shops and amusement parks. Not to worry, this new version will fool the kids who say, "I have one of those," and knock your magic buddies off their feet when you show both the front and back of the deck! There is only ONE DECK used and it is in full view from the start. Tell your spectators that you took a deck and placed it behind your back. You reversed one card and stuck it back into the deck. You do not know the name of the card you reversed, because you don't want someone to read your mind. You want a person to name the card and determine it by their own psychic abilities. You place the deck on the table in full view. Ask anyone to name a card. There are no restrictions, play on words, or magician's choices. No Equivoque. The person can name any one of the 52 cards. The performer immediately picks up the deck that has been in full view and spreads the cards face up, showing one card face down. He spreads through the entire deck showing all the other cards are face up. He puts the face down card on the table. He points out that this is the only card reversed in the deck. He then turns the deck face down and spreads through all the cards showing them all face down! The face down card on the table is turned over and it is the named card! Baffling beyond words! Only 52 cards in the deck. No half/half printed cards, or specially printed cards of any kind. Remember the deck can be spread from front to back showing all faces, flipped over and spread from front to back showing all backs. Resets immediately so you can do this for strolling magic. No sleights or skill needed. This is actually easier to do than the standard invisible deck. An ingenious method that will amaze you. Two different handlings are included, including a version where the deck is removed from the case face down and spread showing face down cards and then flipped over to show one reverse card in the spread. NOTE: If you had trouble in the past trying to do an invisible deck because you could not show the reverse card without fumbling because of your skin texture, then rejoice. This new deck solves that problem, you can instantly show any card reversed with no fumbling or trying to separate rough cards.